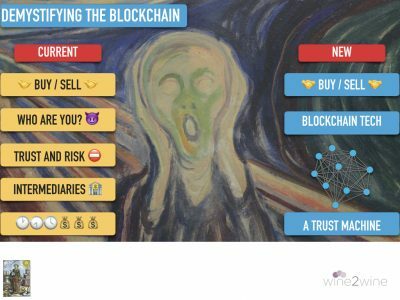 Unblocked is an edited version of my business presentation about Blockchain and wine. 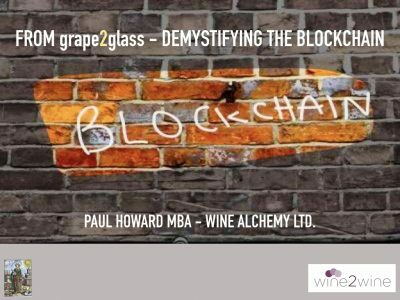 This was made at venues including wine2wine in Verona, called “From grape2glass – demystifying the Blockchain”. The goal was to show at a high level how Blockchain will transform the wine industry. In short, the goal was for the audience to become unblocked. For easy reading, I’ve divided this piece into five instalments, starting here with Part 1. 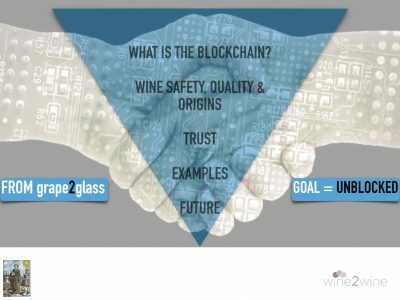 My goal is to explain what Blockchain technology is and how it will transform the wine business, all the way from grape to glass. The hype and money around Blockchain mean there are billions of Euro of venture capital now invested in Blockchain developments worldwide. The Blockchain started out in financial services but its potential uses exist in virtually every business sector. The Wine Industry is no exception. yet so far, this subject has received very little attention. I’m going to explain what the Blockchain is, in nontechnical terms. I’ll explain how it will be used in wine to guarantee wine safety, wine quality and wine origins. Hence this will also enable complete consumer trust in the product and bring benefits to everybody involved in the distribution chain. I’ll use real examples and also try to forecast the future and show what wine blockchains could ultimately become. In short, my task at wine2wine today is to help you become UNBLOCKED. We’ve all heard about Bitcoin, the first of many cryptocurrencies. Well, whatever your views about the merits of Bitcoin, the underlying technology that makes it work is called the Blockchain. The two things are entirely separate and should not be confused. Remember, just like the Internet or Mobile phones, you won’t need to know about the detailed plumbing of Blockchain to use it and benefit from it. Let’s step back for a moment. If you want to buy or sell anything, then firstly, you find someone to transact with, then agree the deal. Goods and money are exchanged. The transaction requires recording, reconciling and probably reporting for tax. It’s simple with cellar-door wine sales. We meet in person; you see my money, I taste your wine. If we both agree, the deal is done. BUT producers need to sell to customers that are far away, that you don’t know and will probably never meet. Is your wine as described? As we will see, trust is always the issue for businesses and for consumers. This age-old commercial problem is called counterparty risk. Commerce works around this risk by using intermediaries such as Banks and Brokers. Intermediaries act as the centralised trust point for both parties. They set rules we play by and keep records, which costs time and money. And, as we saw in the Banking Crisis, third parties aren’t infallible. Up until now, it’s the best we can do. In 2008, someone* combined existing digital technologies in a new unique way to create the Blockchain. Consequently, the Blockchain is a genius mix; of advanced cryptography, Peer-to-Peer computer networks, high-speed automation and a Ledger. Hence the Blockchain is also known as Decentralised Ledger Technology. In fact, it’s A TRUST MACHINE. Now it’s time to find out how it works. That’s the subject of Part 2. *(Satoshi Nakamoto, whoever or whatever that is. But that’s a story for another time). Links to Unblocked Parts 1; 2; 3; 4; 5.